Spooky Reading for Boys and Girls! well as those lucky young people who were present at the events, are reading our featured authors’ books left and right! Let’s also envision boys and girls from all locales benefiting from these literacy promotions once the video recordings of the events are edited, released, and placed on the NCBLA website! Stay tuned! Abigail Adams haunting the White House Laundry Room! c. Mark Teague, 2008. A major method of keeping boys and girls reading is, of course, spooky stories! NCBLA has that genre covered during this Halloween season! One thinks of bones at Halloween, and Thomas Jefferson certainly collected hundreds of bones – monster mastodon bones, that is! Learn more at pages 18-21 of Our White House: Looking In, Looking Out. And, check out the associated Education Resource Guide, too! 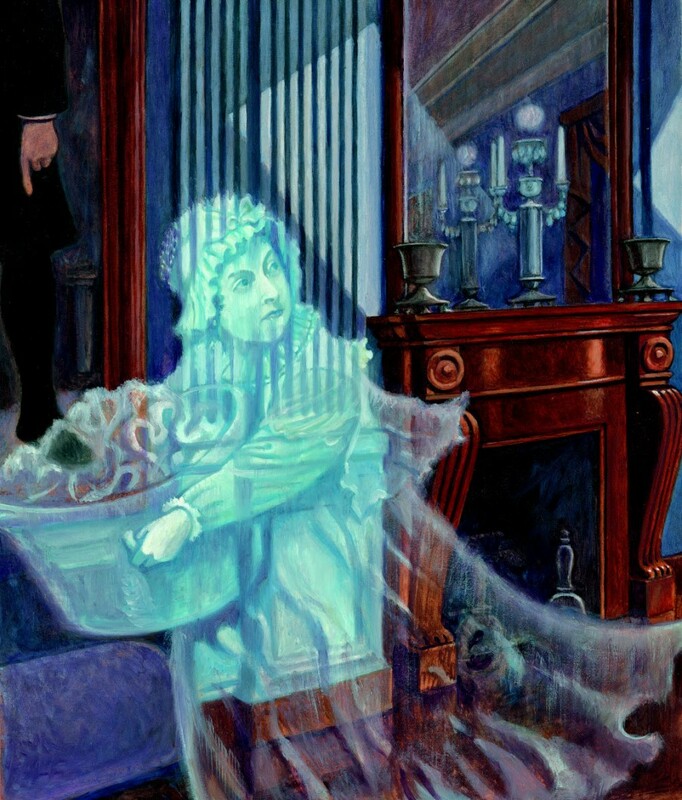 Learn all about White House specters at M.T. Anderson’s The House Haunts (pages 144-146), not the least of which are Abigail Adams and Abraham Lincoln! Also consult the engaging Guide! Kids living in the White House know all about the White House ghosts! Lynda Johnson Robb certainly experienced the mysteries of this great House. Read her story at My Room, pages 170-172. Spy the stealthy Secret Service at pages 196-197, and visualize these “mean dudes” at the accompanying illustration, pages 209-210. Browse through a plethora of websites concerning the Secret Service at this resource. And, read about “floors popping, doors knocking, and drapes sidling back and forth” in the White House at the web exclusive: “Knock, Knock Whoooo’s There: Spooky Stories From Children of the White House.” Discussion questions and classroom activities accompany the article. Enjoy these “treats” from the National Children’s Book Literacy Alliance, and Happy Halloween to all our reading boo-boos!